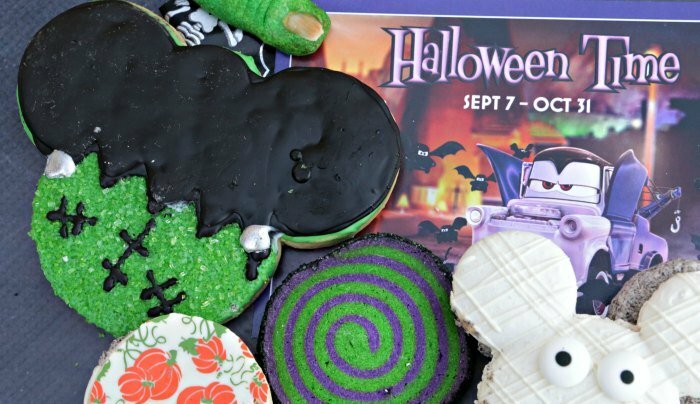 Halloween Time treats are some of the best Disney cuisine- and they’re only at Disneyland and California Adventure for the spookiest time of the year! 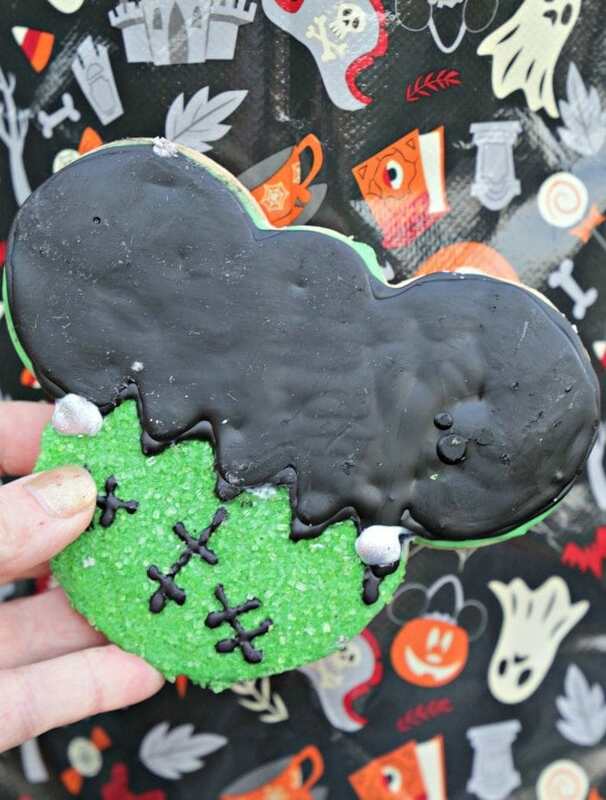 Here’s a recap of our favorite Disney Halloween Time treats! We visited Disneyland for the first time recently and took our preschoolers– and we had the absolute best time because our visit coincided with Halloween Time. Halloween Time is the 6 weeks before Halloween when Disneyland and California Adventure are completely decked out for Halloween- even the characters have special Halloween suits! 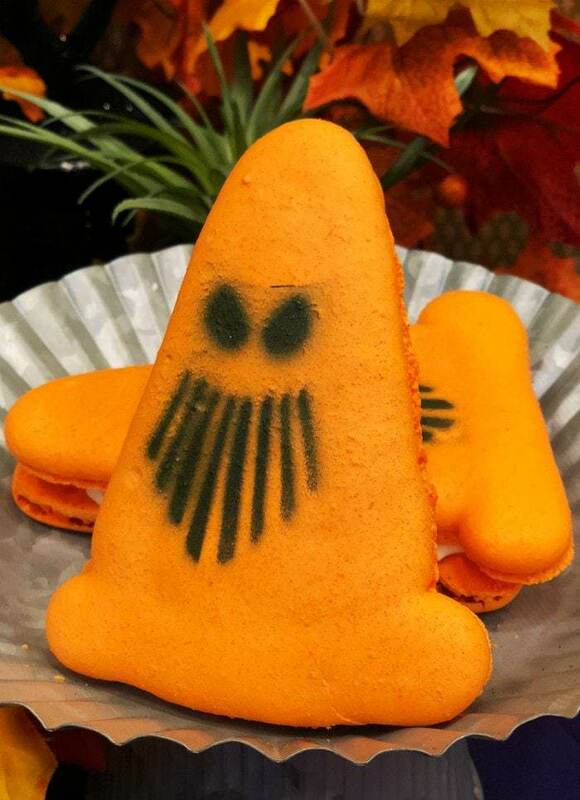 What I didn’t know before visiting is that Halloween Time not only brings out spooky decorations- it’s also one of the best times of year to try delicious limited edition Halloween Time treats and collectible souvenir novelties. 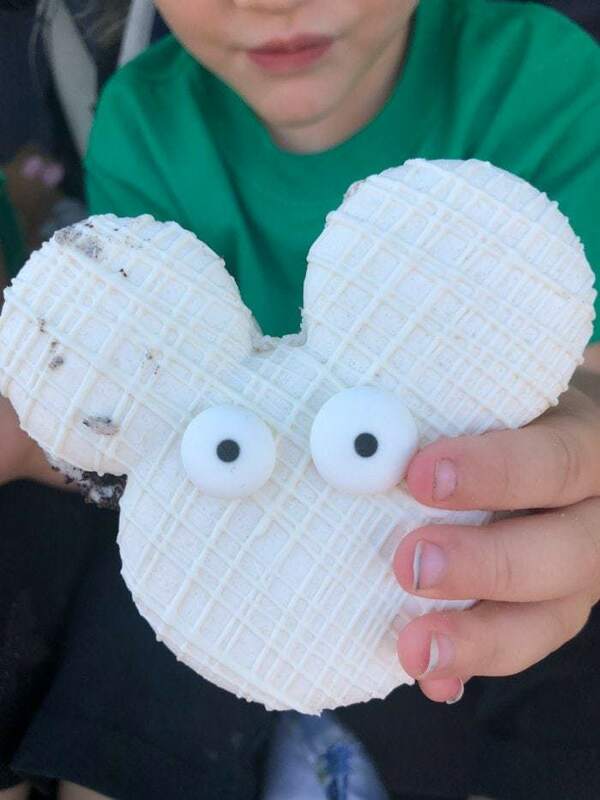 We had the chance to sample lots of treats throughout the park, and I wanted to share the highlights with you. My biggest tip as far as Halloween Time food is this- use the Disneyland app and check which treats you can mobile order. This bypasses lines and allows you more time for eating! The Mickey Mummy Macaroon is found at Jolly Holiday just off of Main Street USA. This was by far our favorite Halloween Time treat. The cookies and cream filling is delightfully sweet, and the macaron is perfectly crispy on the outside and soft on the inside. I seriously think we ate like 10 of these on this trip. The Sweet Potato Hand Pie and Spiced Bundt Cake are also available here. I highly recommend all of them! Get to Jolly Holiday early, however, as they do sell out fast! Best part of Jolly Holiday? Mobile ordering! Don’t miss Cars Land on your visit to California Adventure- it was a highlight of our trip. And when in Cars Land, you MUST visit the Cozy cone Motel for some delicious treats! Each cone has a different specialty- and I loved the “Spoke-y Cone” Macaron. It’s filled with marshmallow fluff filling with candy corn sprinkled in- and I could have eaten 10 of these Halloween Time treats! The Slow Burnin’ Mac & Cheese Cone is also available here- but get there early. Lines are long! Then stop at Flo’s V8 Cafe for a pumpkin tire light up straw. We stumbled upon this fun Halloween Time treat just outside of the Boudin Bakery Bread Tour. We were looking for lunch a bit early, and while waiting we did the bread tour. 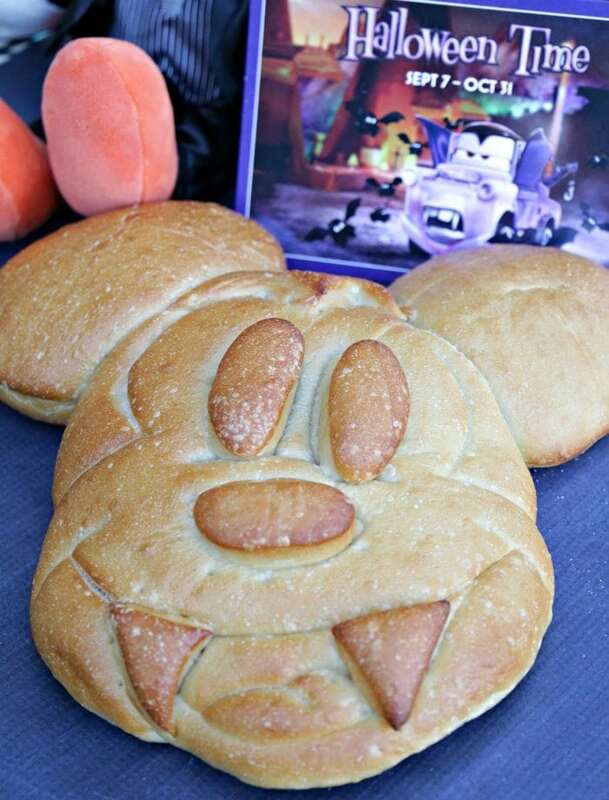 At the end we were greeted with these adorable Mickey Vampire Breads! I loved seeing Mickey with the widow’s peak and fangs. This treat we actually brought home with us and stuck it in the freezer to reheat on a Disney movie night- complete with delicious soup! 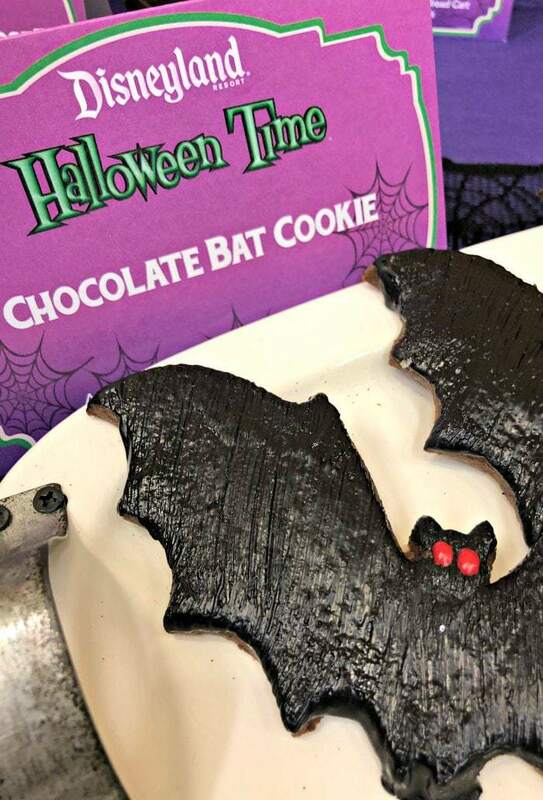 This is another treat we brought home with us- you can find them in many gift shops and they are super easy to pack as fun Halloween Time souvenirs or gifts for friends and family who didn’t make the trip. I will be the first to admit that I am a traditionalist when it comes to Rice Krispie treats- I have never had a packaged one I liked. 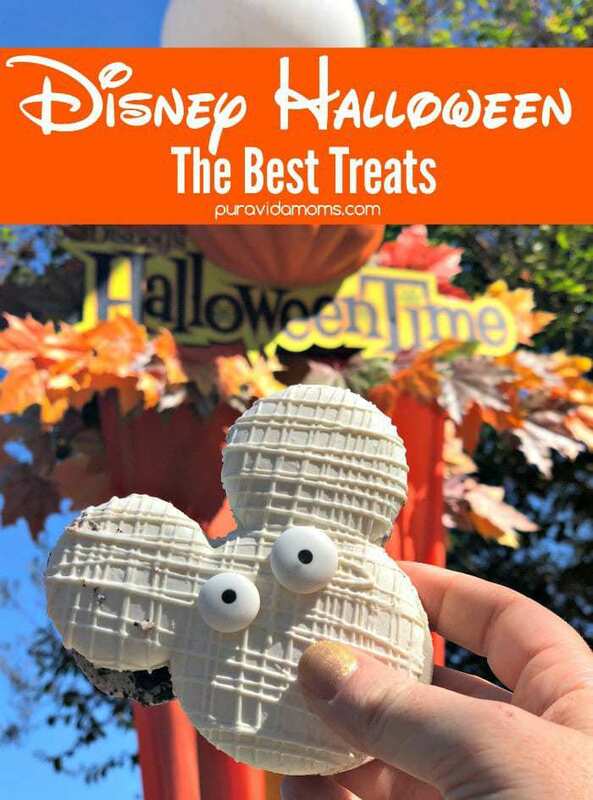 These Mickey Halloween Time treats tasted like home- and I loved them. 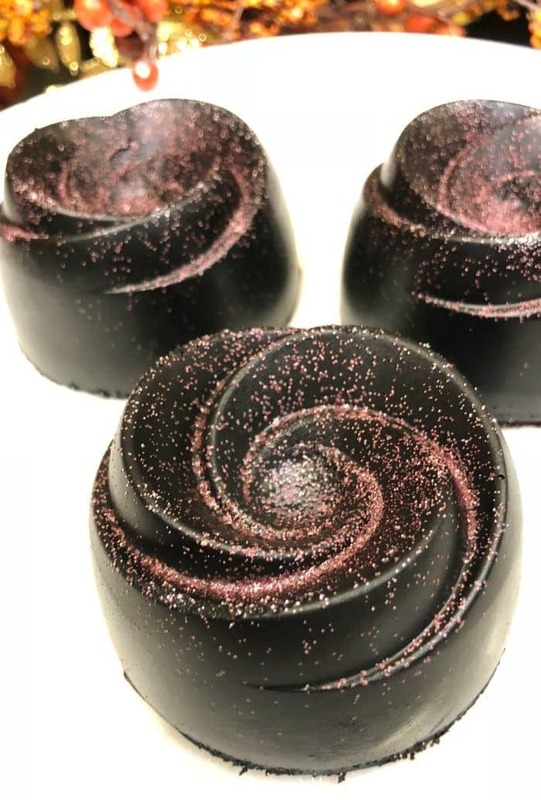 At the Rose Cafe in Fantasy Land you can grab one of these beautiful dark chocolate rose mousse cakes filled with raspberry compote and sprinkled with edible glitter. Not only is the treat beautiful, it’s also delectable. Do not miss this- the cafe is open for breakfast so you can even get one as a mid morning snack! This is a perfect one of the Halloween Time treats to use the mobile app on. This adorable cookie is available alongside the Anti-Vampire Chicken Pizza at Boardwalk Pizza and Pasta in California Adventure. You can also find it alongside the Fresh Apple Spell Lemonade at the Smokejumper Grill- which is available for mobile ordering. We had the chance to try this orange Mickey pound cake and I loved it. the cake is dense and moist, and in the middle of the cake is a blueberry compote that is the perfect combination of sweet and sour. Everything is topped with an orange frosting and a light dusting of the Mickey Mouse ears in cocoa. This was one of my favorite desserts of the trip. It’s huge- we split it between four of us! Little Sister announced as soon as we arrived at Fantasyland that she wanted popcorn, and she as not to be deterred. 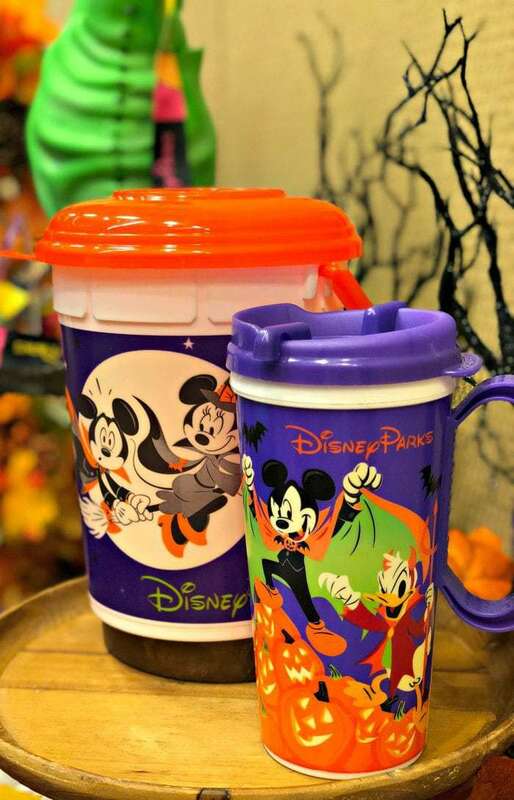 Luckily the popcorn comes in super fun souvenir containers-such as Oogie Boogie Premium Popcorn Bucket and these cute Halloween Time souvenir buckets. We bought two buckets on our stay, and now have commemorative Halloween Time 208 souvenir buckets that will double as our Trick of Treat containers on Halloween this year! 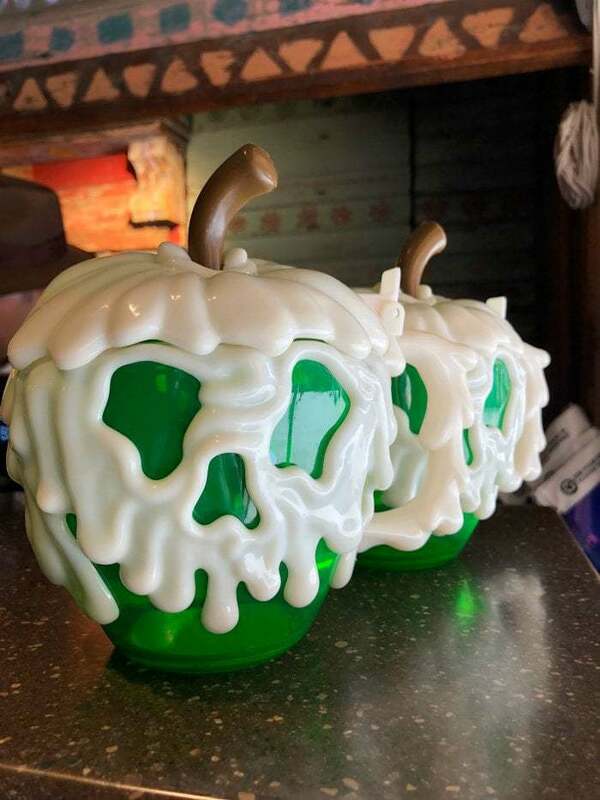 The Cauldron Popcorn Bucket is also super cool! I’m obsessed! 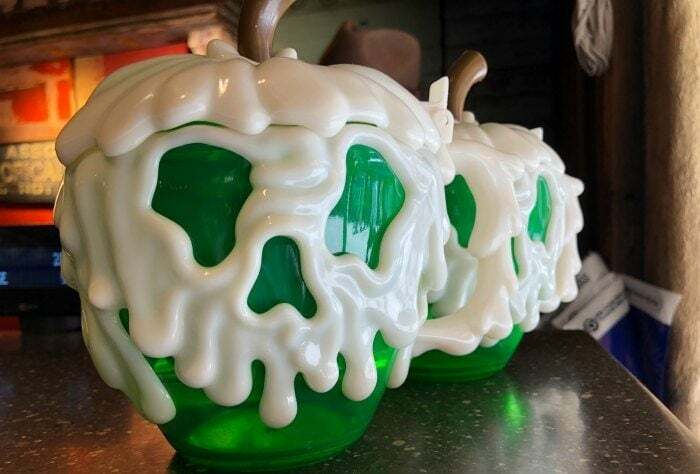 The Poison Apple Mug is so adorable, and you can find it popping up around the park in the most unexpected places. I loved the option to fill it with fresh fruit at the Bengal Barbecue. I waled the park with my Poison Apply Light Up Cube as soon as I got it- it’s even got several settings for the light so it can go faster, medium or just be lit up. You can add it to any drink- I found mine at Jolly Holiday. We introduced Big Sister to churros on this trip, and she was obsessed. The Disneyland churros are an icon, but the Halloween Time versions are not to be missed. 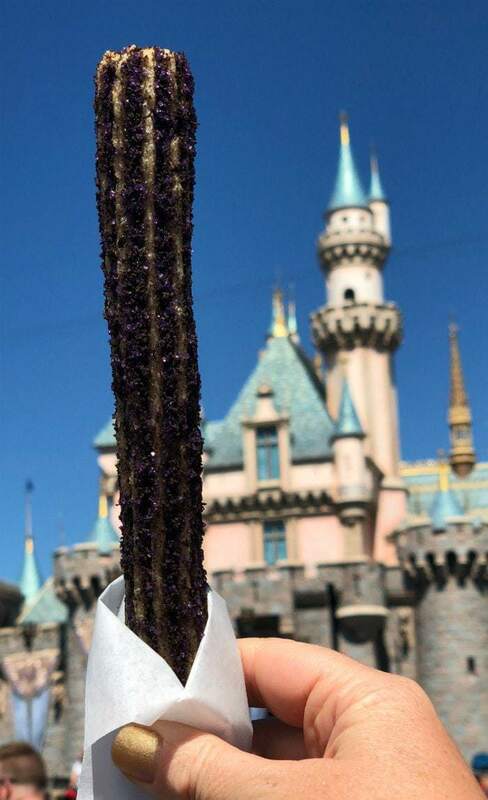 We tried the Maleficent churro at the cart on Main Street. There’s a Pumpkin Spice churro at New Orleans Square, and a Churro Sundae at the Golden Horseshoe that looked awesome! And California Adventure has the S’Mores Churro at the Golden State Churro Cart. So many delicious options- but don’t worry, the signature Disney churros are also still available throughout the park too. Since we stayed at the Disneyland Grand Californian Resort and Spa, we were close to the Great Hall holiday Cart, where we sampled a huge assortment of Halloween Time treats- we even had some delivered to our room! I loved the pumpkin shortbread- it’s filled with dulce de leche inside! Definitely check these out if you have the time. Their gift shop also has the Disney Rice Krispie Treats! California Adventure is home to all things Headless Horseman, and this adorable cupcake will not disappoint! 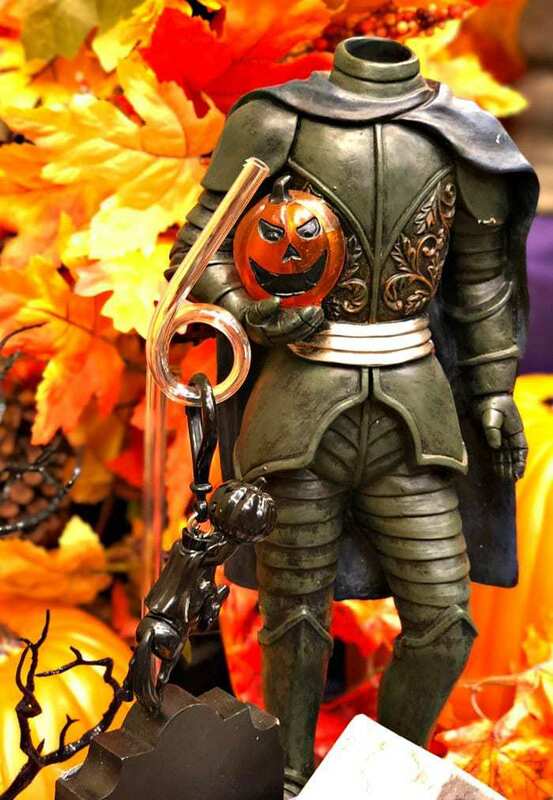 Make sure to grad the spooky Headless Horseman Light Up Straw too! We didn’t get a chance to sample every single treat- but luckily Disney has you covered. 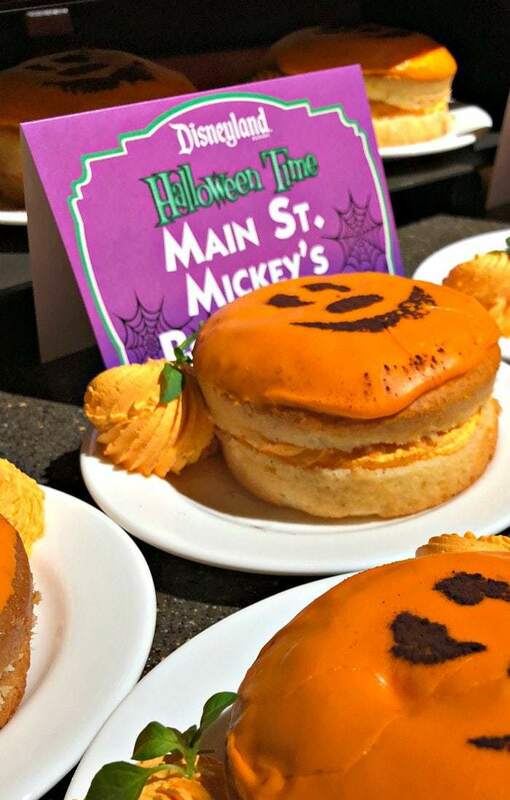 You can find a special Disneyland Halloween Time food guide at Disneyland Resorts properties that outlines every treat available in both Disneyland and California Adventure! What’s your favorite Halloween Time Treat? Looking for more Disney from Pura Vida Moms?